It’s not every day you buy a stakes winner off the back of a cattle truck. But that’s exactly how Steve Pitts got his hands on Bullpit, a tough and durable four-year-old sprinter who has made a name backing up fortnight on fortnight. The Danny O’Brien-trained gelding, pictured, has logged seven wins from 31 career starts before his fifth birthday, including the Listed Queen Adelaide Stakes as a two-year-old, raking in over $400,000 in prizemoney. Not bad for a $3000 yearling out of a little-known stallion called Speed ‘N’ Power. Closely related to champion racehorse Might and Power ­– both by Zabeel, Speed ‘N’ Power’s third dam is Benediction, the dam of Might and Power – the stallion has produced stakes winner Bullpit, full-sister She’s Got Speed and Moonee Valley winner Zahspeed. But the story of Speed ‘N’ Power is an incredible one in itself. He was purchased from Karaka for $1.6 million as a yearling by Sir Patrick Hogan at Cambridge Stud, New Zealand, but never made it to the track due to a pedal bone injury. The 11-year-old is now hidden away in a tiny NSW Riverina town of Wakool at Tulla Stud, servicing a handful of mares a year – most of them bred by the stallion’s owner Paddy Hare. Hare bred Bullpit and She’s Got Speed out of Estambul mare Madamesta, as well as Zahspeed out of Zedative mare Zedoble, before selling them as yearlings off the back of his cattle truck to Pitts for $3000 each. “I used to have a horse trained at Albury (by Rob Wellington), a horse called Speedy Holly by Speed ‘N’ Power,” Pitts said. Speed Holly “showed some ability” but didn’t quite get enough opportunities to put it all together. But Pitts liked what he saw, and took a punt on two more of Hare’s yearlings – one out of Madamesta and one out of Zedoble. When Bullpit claimed a stakes race at start No. 4, Pitts was hooked. He bought Bullpit’s full-sister She’s Got Speed before purchasing their dam Madamesta. “I’ve got another full brother coming through who’s a two-year-old and has shown good ability and will race as a three-year-old, plus a half-sister by Your Song,” Pitts said. But Hare said the stallion’s pedal bone injury continued to be an issue, hence the limited number of services. “He’s only done about 30 to 40 (services) over eight years,” Hare said. “If everything turns out, he’ll service 10 or a dozen this year. His pedal bone just swells up then bursts out – I’ve got to give him antibiotics, it’s been going on for years. While Hare has only raced one Speed ‘N’ Power himself, which he admitted “wasn’t any good”, he said the stallion was ready to show off some talented progeny. “A lot are going to win in the next 12 months,” Hare said. Speed ‘N’ Power, the only stallion at Tulla Stud, stands for a $4000 service fee. 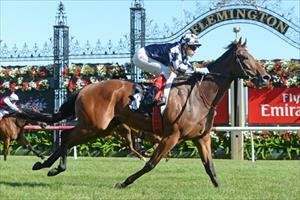 Bullpit runs in an 1100m race at Flemington on Saturday. O’Brien said the gelding was likely to spell following this weekend with a Listed 1100m race on Melbourne Cup day penciled in as a possible spring return.